Published January 15, 2014 Disclosure: We may receive compensation if you sign up for or purchase products linked to below. We try our best to provide the most accurate information, but details do change. Please refer to the company website for the most up-to-date information on any lead or recommendation. Food Blogger Pro has long been on my To Review List. This course was developed by the owners of Pinch of Yum, a successful food blog currently earning into the five figures each month. The owners share their knowledge on how to start a food blog and turn a profit. As a blogger myself, I’m always interested in how other industries operate, where they make their money and what platforms are sending them traffic. This isn’t a one-size-fits-all career! Though we may all buy a domain and install WordPress the same, the road to success can head off into different directions from there. When a reader asked that I consider a Food Blogger Pro review, I was happy to oblige. You never know what you’ll learn! Whoa! There is way, WAY more information in there than I ever expected. Bjork is the main instructor. He is welcoming. He explains everything well and doesn’t speak down to beginners or go off on off editorial tangents. Well done! I love that little details often avoided by those teaching beginners -but eventually become important down the road – are covered. The course is good for even those that haven’t yet purchased a domain or even know the difference between WordPress.com and WordPress.org. Those first steps are covered. There are even some really great customization tips included. 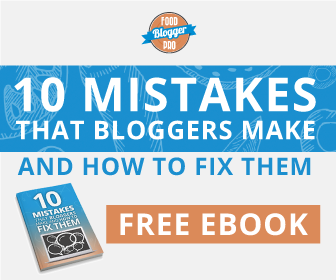 If you are a seasoned blogger, you can skip the basics. You can also skip around through the modules if you would like. No “unlocking” courses before you can move forward. I liked that they didn’t assume you know your way around. Many tutorials jump over little details like changing your theme’s colors, assuming you know or telling you to Google it. Food Blogger Pro covers them. If you are still confused, there is a community forum for getting help. There is a lot of information covered within this course. A lot! But it is consumable and how it is presented ensures it isn’t overwhelming. Most videos are around 6 minutes long. Updates are available to members. They have added new videos as late as last month. There were also a few courses within the program that have been updated due to changes in the blogging landscape or specific tool. You aren’t abandoned after completion. Much of Food Blogger Pro is budget-friendly. Most of the basic setup is done with free tools available online with more advanced techniques and premium offerings being optional, though in some cases recommended. There are some really great topics in here that I didn’t expect to see and don’t recall seeing in any other courses I have taken; Google Alerts, URL shorteners, FTP, giveaways, etc. Great information given in regards to the what, why and how of these things. Photos – When I think “food blog” right now, I think tons of traffic potential and eye-grabbing images are absolutely essential. There is a huge divide in photo quality in this industry. Those who have it are reigning in the big traffic numbers from Pinterest and recipe networks. Those without it are struggling in many instances. Linsey takes over the photography section and she does an amazing job. Her videos include everything from aperture on your DSLR to lighting to props to editing in PhotoShop and Lightroom. This isn’t such a budget-friendly section but it will make a huge difference in your referral traffic guaranteed. Oh my goodness there is some good stuff in here! Traffic – Food Blogger Pro includes almost everything you need to know when it comes to getting traffic; SEO, the best referral sites for food blogs and getting the most from your social networking. There is also a section full of easy traffic tips that includes a few little things that can get people coming over to your blog from other places online. Income – I love that they include more than just AdSense which has always been a cop-out in my opinion. Things like affiliate marketing or creating an eBook are courses in themselves so some programs tell you to install AdSense and you can learn the rest somewhere down the road when they won’t have to be bothered with you anymore. Not here. They provide you several great options and tell you how to get them up, running, making money and complimenting each other. I’m not a huge fan of video because I no longer have a lengthy attention span. Blame it on blogging. That being said, being forced to watch videos makes me slow down. I can’t skim or skip. That’s sometimes a good thing. There is a lot of great information in here about why you should use certain things and how to customize them to fit your needs and preferences – information I would have likely skipped over in written text. While I’m not a big fan of ongoing memberships, I think a one-time price for this amount of in-depth information would be far out of reach for most beginning bloggers. I also don’t know that you would want to tackle everything in here in just one month. If you have ever blogged, you know it’s a marathon and not a sprint. In most cases you are not ready or able to monetize within your first few weeks online. This course and community are here to support you long-term, just as your new food blog hopefully will. I was blown away by this program. Visit the Food Blogger Pro site to learn more and get your new food blog started today. This one only opens to new members a few times per year, so get on the waitlist while you can! Hey Angie! Thanks so much for taking time to provide such a thorough review of Food Blogger Pro. I think you have a really good point with balancing the type of content that we’re using to teach people on FBP. We could definitely use other forms of education. Thanks for the feedback! Thanks for stopping by, Bjork! You have an amazingly thorough program that would be an asset to any food blogger.